You approach your horse’s stall or paddock only to be greeted by flattened ears, flared nostrils, and a swishing tail, even threats to charge, bite, or kick you or nearby horses. This aggressive body language is clearly threatening harm to anyone who comes into your horse’s space. If this scene sounds familiar, it’s time for a change. 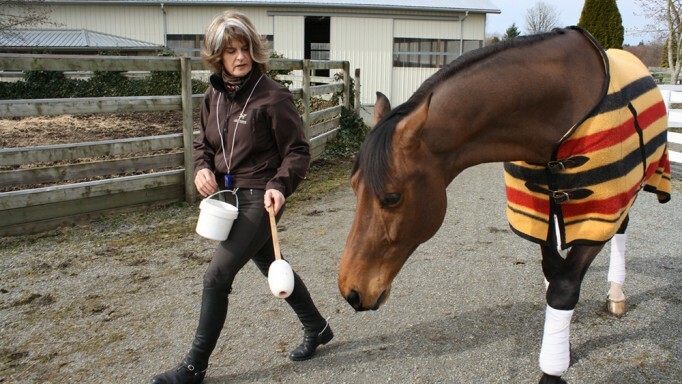 Anyone who handles your horse should be able to safely enter his stall or paddock at any time without fear. Even when he is eating, or you are bringing him food or water, you should be able to go into his stall and move him away from his meal without being threatened. 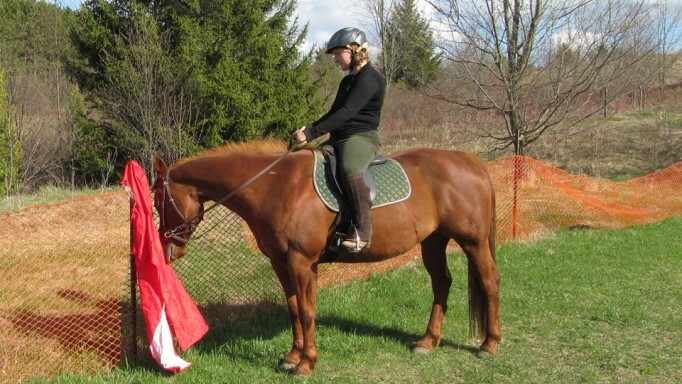 Your horse should display passive body language and easily move out of your way when asked. In this article, we will look at why some horses become aggressive about their food, and what you can do to improve a pushy horse’s table manners. Wild horses rarely become aggressive about food, even if it is scarce. Since space is virtually unlimited, the herd just moves on to find more food or water. They graze for at least 16 hours each day and, depending on the availability of food and water, will walk many kilometres as they do so. The lives of domesticated horses are very different. They generally live in situations where space, food, and water are limited resources. Their pasture mates are chosen for them, and groups often change. These living arrangements make their eating habits very different from their wild cousins. They may receive food only at specific times every day, quickly eating up their ration in an hour or two, which leaves several hours to stand around waiting for their next meal. This cycle creates anxiety and competition over food, and aggressive behaviour becomes the conditioned response at feeding time. If your horse is stressed or very hungry, his anxiety will increase as feeding time approaches or he sees you coming with his food. He may initially communicate his anxiety with subtle whispers of body language like a muscle twitch, which can be difficult to notice. This tension can then quickly change into more obvious behaviours like pacing, weaving, pawing, or banging his stall door. As his anxiety builds, so does the aggressiveness of his body language, escalating to displays which are much easier to read. Ear-pinning, charging, and threats of biting or kicking are very clearly telling anyone nearby to get out and stay out of his way immediately. Slow feeder nets and devices effectively decrease wastage and slow down the rate at which horses consume their hay. As they eat at a more natural grazing pace, the length of time the horses have no food available is significantly reduced. As flight animals, horses are naturally claustrophobic and the herd hierarchy continues to affect them even through the stall walls. One way of reducing tension is to know the hierarchy of the herd, and not put horses who don’t get along next to each other. For your horse to consistently show you passive body language in every interaction with him, you must be consistent in your behaviour – as well as your expectations of his behaviour towards you. It’s not necessary to have specific training sessions for this to happen; you are training a horse every time you are with him. He always reads your body language and intention (i.e. passive, assertive, aggressive, fearful, etc.). Changing your horse’s aggressive behaviour is possible, but, as with all good training, it takes some time and effort on your part. If your horse is inclined to run over you or threatens your physical safety in any way, get help from an experienced professional. Remember that horses are experts at reading our body posture and tension. Always approach your horse by moving assertively, but not aggressively, towards his shoulder. Avoid sending any pushing energy towards his head or neck, as this is offensive to him. When your horse is passive, ensure that your body language is also passive. Picture a large bubble around you that defines your personal space and is at least the length of your whip. Your horse is not allowed to cross the outer boundary of this bubble. If your horse moves into your space with aggressive body language, push him away by firmly moving the whip towards the part of his body that is coming towards you – his chest, shoulder or hips. If he still continues to move towards you, the last resort is to give him a “bite” with the whip on the appropriate body part. If he moves away, but turns his hindquarters towards you or kicks out, give a strong push or ‘nip’ to his hips. You are looking for the horse to move out of your space without threatening you or pushing into you. When your horse is showing passive body language and staying out of your space, introduce some food in a bucket. Use some grain or his favourite treat. If your horse shows even the slightest sign of pushiness or aggression, send him away from the bucket. When he shows passive body language, move away from the bucket and allow him to eat a bit. It is natural for a leader to be able to push another horse off food. Ask your horse to leave the food by moving towards his shoulder with appropriate body language, sending his shoulder away while blocking his head from coming in. Pay attention to how he leaves. Respond to aggressive behaviour by assertively and firmly pushing away the offending body part. Reward his passive behaviour by retreating and allowing him to come back to the food. Recognize that equine aggression is a form of communication used to protect a horse that feels threatened or frustrated in some way. 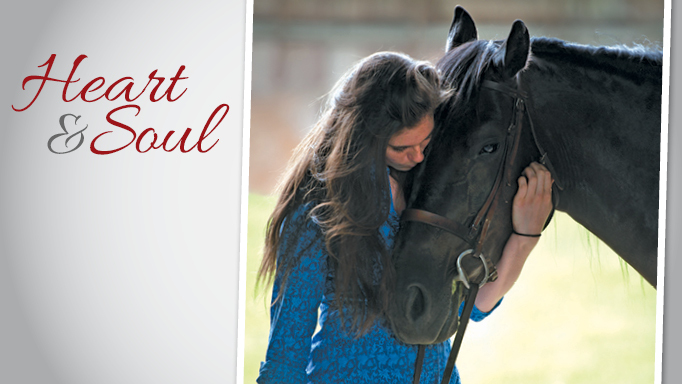 You will improve your relationship with your horse when you are consistent with your own behaviour, aware of your own and your horse’s body language, and apply herd dynamics to all of your interactions with your horse. Feeding time will be stress-free and safe for both of you. 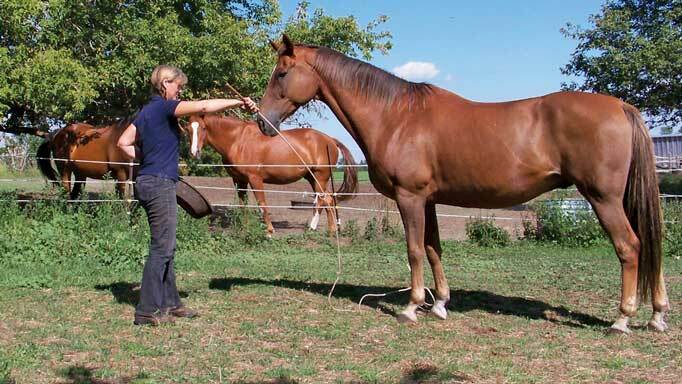 Dog trainer, Karin Apfel, describes how to create safe introductions between horses and dogs.